VA Crane Rental can lift HVAC equipment across the great State of Virginia. Our extensive fleet includes a crane for any heating and air conditioning companies. They run around town and fit in compact sites like a boom truck, yet lift more, higher, further, and smoother. If your company uses cranes to install HVAC equipment in Virginia, you’ve probably used us more than once. If you haven’t, give us a call at (800) 272-6339. You’ll get a meticulously cared for crane, with a proficient operator, at a money saving minimum. Let us know your reach and load requirements and we’ll tailor the crane size to your particular HVAC lift. Crane HVAC lifting is safer and more beneficial for your business. Removing a rooftop HVAC unit without a crane can be time consuming and often quite dangerous. At VA Crane Rental, we often see our customers remove and replace several units at a time. 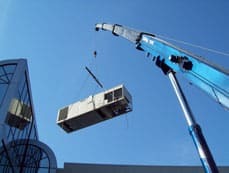 That is, most crews can remove the old HVAC units, swing in the curb adapters, then lift the new units into place… all within the minimum crane rental.